Did you know that for absolutely no cost to you or your family, you can make your very last living act life changing: You can give someone else the most important gift they will ever receive. We’re talking about becoming an organ donor. Despite the importance of organ donation, some people still have reservations about opting into the donation program. Read on to learn more about how you can help. We’ll also dispel some commonly stated hesitations. Organ donation statistics are staggering. In 2013, of the 118,000 organ donors on the wait list, only 8,143 individuals received transplants. Kidney donation is one area of great need. About 3,000 individuals are added to the kidney donation wait list each day, and 12 people die every day while waiting for a transplant that didn’t come soon enough. Although kidneys are one of the most needed, they aren’t the only donation that saves or improve people’s lives. Other organ donations, such as heart, lung, pancreas, and liver transplants, are also frequently used. Doctors can also transplant corneas, bones and bone marrow, skin, and other parts of the tissue. Organ donation rates vary worldwide. Spain has the highest organ donation rate, with Croatia and Portugal in second and third place, respectively. The United States ranks fourth. Nine in 10 U.S. adults say they support organ donation, but only 45 percent are registered as donors. This discrepancy is because organ donation is an opt-in system. In most countries around the world, including the United States and Canada, you must choose to become a donor. Unfortunately, this means some individuals never make the decision to opt in to the program, meaning there is a huge gap between the number of organ transplants needed and the supply of organ donations to go around. The countries with the highest organ donation rates, like Spain, have opt-out systems. There are a number of misconceptions related to organ donation that need to be clarified prior to becoming a donor; these are often stated as the reason for not donation. 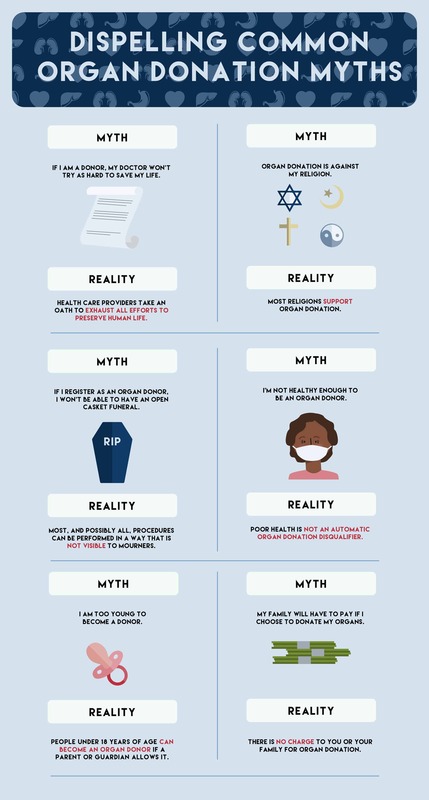 Here are those myths and their realities. Myth: If I am a donor, my doctor won’t try as hard to save my life. Reality: Many folks feel health care providers will not work as hard to save their lives if they plan on donating their organs. The opposite is true: Doctors work to save your life first. Health care providers take an oath to exhaust all efforts to preserve human life. Reality: Some individuals believe organ donation is against their religion, when in fact most religions support organ donation. Myth: I am too young or old to become a donor. Reality: Those under 18 years of age may think they are ineligible to donate, and legally, they are. However, these individuals can express their desire to become an organ donor to their parents or guardians, who can agree to allow them to become a donor. On the flip side, some people feel they are too old to donate an organ. In reality, stringent medical criteria decides which organs can be used. No age is too old for donation. Myth: If I register as an organ donor, I won’t be able to have an open casket funeral. Reality: Some individuals think donating organs will prevent an open casket funeral, but it won’t. Most, and possibly all, procedures can be performed in a way that is not visible to mourners. Myth: I’m not healthy enough to be an organ donor. Reality: Poor health is not an automatic organ donation disqualifier. There used to be restrictions on who could donate kidneys, but now almost anyone can donate a kidney to help. Myth: Famous people get priority on the organ waiting lists. Reality: Some people are under the assumption that celebrities are given priority, but celebrity status and finances are not considered when allocating organs. Myth: My family will have to pay if I choose to donate my organs. Reality: There is no charge to you or your family for organ donation. Registering to become an organ donor is relatively simple. In the United States, you can register at the Department of Motor Vehicles when you obtain or renew your driver’s license. You can also sign up through your individual state registry. These two methods allow you to give someone a second chance at life. If you need more inspiration about becoming an organ donor, listen to transplant recipient Lauren Mulholland’s story. Organ donation gives you a unique opportunity to give someone a second chance at life. Adults and children alike require donated organs. Act today to become an organ donor—you could have a lifesaving impact on someone. There are still more than 124,000 men, women and children on the waiting list for organs, so don’t hesitate. The need is too great. Adrienne Erin is a freelance writer based in central Pennsylvania. Her passions include cooking, gardening, yoga, and taking road trips. You can follow @foodierx on Twitter to get in touch, or visit Foodie Fitness to see more of Adrienne’s writing. Win an Apple Watch Sport + More!